Package your sensitive components to perfection in the Chamber Vacuum Sealer - the AVC-20. The AVC-20 is designed for trays, tape and reeled products, and many popular shipping tubes. It produces clean, wrinkle-free seals by creating the seal before the bag distorts. Throughout their journey, your valuable products will be assured of arriving in a safe, dry, and contaminant free environment. The AVC-20 will quickly and efficiently vacuum seal your products at touch of a button. The elimination of excess air reduces space for more economical shipping costs, holds contents in place to prevent damage, and prevents any static generation. The AVC-20 achieves consistent vacuum pressure by allowing you to preset the level you require. 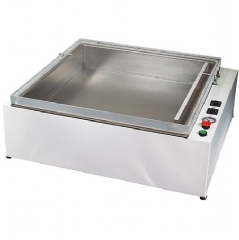 The large 55.9cm x 55.9cm x 10.2cm Vacuum Chamber will accommodate large products.